You want to learn how to invest in bonds but don't know where to start. You've come to the right place. This page will give you a basic overview of the process as well as a link to some wonderful resources that can explain, in depth, different areas you may want to explore. By working your way through it, you will find links to many bond investing articles. You can click on each link, read the article, and then come back here until you've finished. By the time you're done, you should know enough about bond investing to ask questions of your broker, financial adviser, registered investment advisor, or asset management company. The biggest benefit is that you are less likely to feel emotional about your investment decisions when you understand the language and risks. Before we begin, here's a quick overview: Bonds are a type of investment that results in an investor lending money to the bond issuer in exchange for interest payments. Bonds are one of the most important investments available for those who follow an income investing philosophy, hoping to live off the money generated by their portfolio. With the different options available to you, including municipal bonds, commercial bonds, savings bonds, and treasury bonds, you need to know which is right for your unique situation as well as the dangers presented by owning different types of bonds. There are several types of bonds in which you can invest and even more ways you can hold these bonds. Here are some resources and articles that you may want to consider. Unfortunately, the answer isn't so clear. Benjamin Graham believed that defensive investors should never have less than 25% of their portfolio in bonds but price and terms matter; e.g., look at the insanity of investors investing in bonds with record-low fixed yields and maturities of 50 to 100 years. Investing in Corporate Bonds: By lending money to companies, you can often enjoy higher yields than you get on other types of bonds. For most investors who are in middle to higher tax brackets, it's better to buy these in a tax shelter such as a Rollover IRA. Investing in Municipal Bonds: This complete beginner's guide to investing in municipal bonds, which are exempt from certain state taxes under certain situations. It is a great place to begin if you are in a middle to high tax bracket. By investing in your local schools, hospitals, and municipalities, you can not only help your community but also make money. Once you're ready to move beyond the very basics, you can read Tests of Safety for Municipal Bonds. This article will teach you some of the calculations you can do, the considerations you should make when looking at a municipal bond investment. US Savings Bonds: Get a broad education on savings bonds, their history, considerations before adding them to your portfolio, and tax notes. 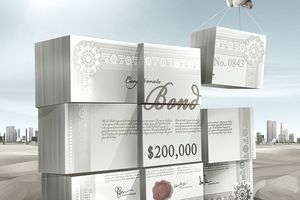 Series EE Savings Bonds: These unique bonds offer tax advantages for education funding, the guarantee of the United States Treasury, a fixed rate of return for up to thirty years, and more. Series I Savings Bonds: Series I savings bonds feature an interest rate based, in part, on changes in inflation, are guaranteed to never lose money and are backed by the taxing power of the United States Government. This collection of articles will teach you how to invest in Series I savings bonds, tell you who is eligible to own them, and explain the annual purchase limits. Junk Bonds: One of the most alluring types of bonds new investors often spot is something known as a junk bond. Boasting high, double-digit yields during ordinary interest rate environments, these dangerous bonds can lure you in with the promise of big checks in the mail, yet leave you high and dry when the companies that issue them miss payments or go bankrupt. Stick to investment grade bonds, instead. If you don't know what you are doing, be extra safe and reserve your holdings to Triple-A rated bonds. The Many Flavors of Preferred Stock: The preferred stock of many companies is actually very comparable to bond investments because both types of investments tend to behave the same way. To understand bond investing, you need to understand preferred stocks because the tax laws allow you to pay between 0% and 23.6% on dividend income received from preferred stocks, compared to full 39.6%+ depending upon your tax bracket on interest income on bonds. Although bonds have a reputation that makes people believe they are safer than stocks, there are some real dangers that can hurt new investors who don't know how to reduce risk. How Bond Spreads Can Hurt Investors: Bond spreads are a hidden commission charged to you when you buy or sell bonds. They can sometimes cost you hundreds of dollars every time you buy a single bond! Learn how to identify them and ways they can be minimized. Understanding Bond Duration: This seemingly simple term actually refers to the fact that if you buy a bond that matures in 30 years, it could fluctuate far more violently than a bond that matures in two years. In some cases, bonds with high durations can actually fluctuate as much as stocks! Learn what bond duration is and how you can calculate it in this important article. The Danger of Investing in Foreign Bonds: When you buy bonds of other countries or even companies located in other countries, there are very real dangers that you are not exposed to when you purchase in your home country. If you owned bonds in oil companies headquartered in Venezuela, for instance, you would have found your assets nationalized and seized by dictator Hugo Chavez without any way to recover what you lost. This article explains those dangers and some of the things you can do to reduce them. Bond prices are often used as a valuation tool to help professional investors determine how expensive stocks and other assets are. This is done by comparing bond yields on certain types of government bonds to earnings yields on a stock.